Well after all those 100 long days Divi 3.0 is finally here. Now it is time for updating our sites and checking if everything works alright. 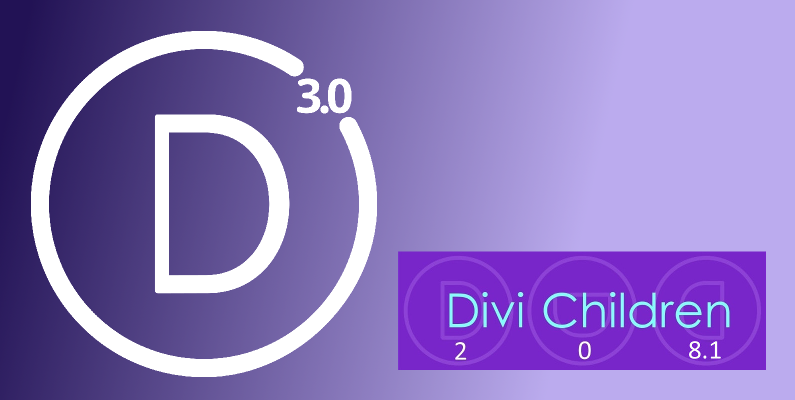 So if you´ve used Divi Children to create your Divi child themes in the past, you may be wondering whether you can still use it with Divi 3.0. The answer is yes; I´ve been testing it with the Divi 2.9.X beta versions and now with the final Divi 3.0 released version, and the current version of Divi Children is compatible with the new Divi 3.0. I did encounter a couple of small issues related to theme mods initialization values in the Customizer, but nothing to worry about or to make a new update necessary. Changing the value of the setting or checking/unchecking the option and hitting he Customizer “Save” button does the trick. Remember that the Divi Children plugin does not need to remain active in your site after you´ve used it to create your child theme. So in case you have any issue with it (a compatibility issue with any other plugin, for instance), you can not only deactivate Divi Children, but even delete it from your site. You won´t need the plugin again unless you want to create yet another child theme. Divi Children allows you to create Divi child themes that come with customization options to make everything easier. It was the first solution for customizing the Divi footer credits the easy way and, as far as I know, it´s the only free product that lets you modify your footer credits any time you want by means of the Customizer. Many people use Divi Children to create their client child themes because of this feature, but Divi Children also offers some other nice child theme customizing options. 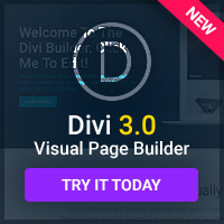 So if you´re never tried it it´s never too late, because the current Divi Children 2.0.8.1 version works with Divi 3.0. You can get it for free at the Divi Children download page. Of course, should you find any issue, I´d appreciate if you let me know about it as soon as possible. Thanks to all of you who appreciate it. As I´ve already explained on other comments on this blog, Engined was a great child theme that took many months to develop and provided a lot of features not previously available in Divi out of the box (more than 500 settings in the Customizer), but all the (not backwards compatible) changes ET introduced after Divi 2.4 made it very difficult and tiresome to have it permanently updated to the latest Divi version, because I consider updates as “upgrades”, while in this case they would be something like “downgrades”. That´s the reason why after the Divi 2.5 release I´m not updating or testing Engined against new Divi versions anymore. Engined still offers many features not available in Divi, so you still may want to use it. In that case, just take into account what I mentioned about repeated or equivalent settings and Customizer settings precedence on the Engine 2.0 release post. Thanks! What can Engined do that 3.0 can’t? With more than 500 custom settings, there are quite a few things that don´t come in Divi out of the box. I mainly use it to customize the Footer Credits as you mentioned, but there are some other cool customization features in there too. Luis, installed the child plugin with Divi 3.01 today and it fails to change the footer. Note that Divi 3.01 now has that feature built in to the customizer settings. I know, Dennis. I´m preparing an update to be released today. Thank you very much for this very useful tool. I have not experience dealing with child themes, but I thought it is time to start learning about. It is my first time creating a Divi child theme from an already existing Divi WP Site and I do not know how it should work. I notice that the Divi Sidebars created in the Divi theme are not present in the Divi child theme, but they seem to appear as unused sidebars without the name I gave them. Also, the menus have to be reassigned to their locations and the footer styling has been lost. I would like to ask if this is the normal behaviour when creating a child theme in these circumstances and if what I should do is to reassign the menus, adjust the footer styling and create again the Divi sidebars. Thanks once again for your great plugin and for your help. Yes, that is the normal behavior. When you activate a new child theme it is the same as when you activate a completely different theme for the first time, so you have to reassign menus and everything. 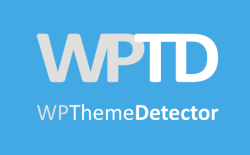 However, if you swap themes later on, you´ll notice that WordPress “remembers” those settings. Thank you very much for your response. Now I feel reassured that it is working as it should and I am doing it the right way. I ‘m very new to Divi and started working on the theme without creating a child theme. I’m venturing into making a child theme, just wondering if I should do it manually or use the plugin. Will the changes that I have made to the Divi WP site will stay if I use the plugin to make the child theme? Do you suggest I download a fresh Divi theme if in future I need to make child themes. Thanks so much for this amazing tool. I wanted to ask if it could be used to create free and premium child themes to distribute. If so, is there any attribution that needs to be given? But it´s all up to you. I´m glad you like it.